Could Solar Power Solve Lebanon’s Electricity Crisis? For many areas of Lebanon, there is a ‘before’ and ‘after’ the Civil War (1975-1990) in the economic field. 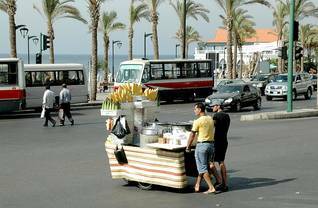 During the first decade of the Civil War, the Lebanese economy proved remarkably resilient. Eventually, however, the Lebanese pound plummeted as a result both of the destruction of the infrastructure and government policy. One of the very few temporary positive effects of the Civil War was that the economy became less centralized and less centred on the Beirut area. After the Civil War, in the 1990s, Lebanon embarked on an ambitious programme of social and economic reconstruction, initiated by Prime Minister Rafic Hariri in the 1990s. The so-called Horizon 2000 Programme aimed to restore Lebanon’s traditional status as a key regional centre of finance and commerce. Reconstruction of physical infrastructure was carried out and international companies started to return to Lebanon. In practice it mainly focused on Beirut. Since the reconstruction programme was financed through borrowing, it resulted in a heavy governmental debt load. In order to attract and encourage investment, tax rates were reduced. This in turn led to severe budgetary austerity, resulting in limited investment in Lebanon’s social infrastructure and a growing reliance on indirect taxation. Hence, the gap between rich and poor increased considerably. 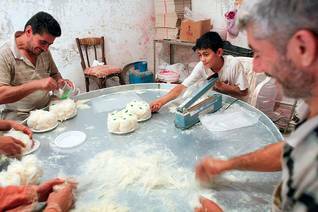 A small proportion of Lebanese made a fortune thanks to the reconstruction programme and low income taxes, while many others came to live below the poverty line (one in three Lebanese in 1998). According to political science Professor Tom Najem (University of Windsor, Canada), the Hariri government faced a number of obstacles with respect to implementation of the recovery programme. In addition to the growing debt level, the government failed in succeeding to reform the inefficient and corrupt public sector. Hariri himself was increasingly accused of corruption as tensions within the political system over the recovery and reconstruction process mounted. Syrian control over Lebanon meant that Lebanese politicians were divided between pursuing Syrian interests and implementing reforms. Most notably, the main goal of the programme: enhanced involvement of the private sector in the economy, never really materialized. By 1998, the growing debt problem created by the reconstruction programme and the collapse of the real-estate sector had brought Horizon 2000 to a halt. After his comeback in 2000 as Prime Minister, Hariri tried to solve the economic crisis by presenting his policies to the International Monetary Fund and World Bank at a donor conference in Paris in 2002. The pledged grants and loans (worth over USD 10 billion) helped Lebanon to deal with its immediate financial crisis. Yet Hariri’s position was now debilitated, hampering the implementation of his plans. After the devastating war between Israel and Hezbollah in 2006, the Siniora government presented a new reform programme promising significant economic, social and tax reforms and further privatization. Progress has since been slow due to the continuous political instability and divisions in Lebanese politics. After 2007, the Lebanese economy managed to grow despite the global economic crisis. 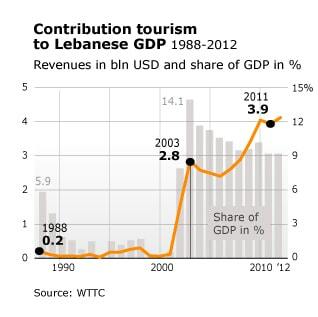 2009 saw a record number of tourists, the construction industry saw significant growth (in part due to reconstruction after the war with Israel in 2006) and the Lebanese banking sector continued to attract significant investments. Since 2011 the escalating crisis in neighbouring Syria and its effects on Lebanon have had a negative effect on the Lebanese economy. Investments decreased and tourism took a downturn as the security situation deteriorated. The number of tourists declined by 17.5 percent in 2012, the lowest level since 2008. Lower economic activity coupled with domestic political instability have put the government under considererable pressure. Lebanon’s fiscal deficit rose by 47.6 percent in 2012 after two years of improvement. Overland exports were hit because of the conflict in Syria. 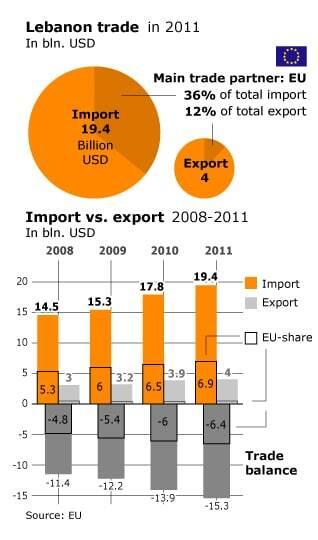 Lebanon’s trade deficit rose by 5.7 percent to reach USD 16.8 billion in 2012 (in 2011, it had increased by 15.9 percent). On the other hand, agricultural and industrial exports increased as a result of higher demands from Syria and Gulf Cooperation Council-countries. According to the World Bank, exports slowly recovered in 2012 after alternative trade routes were devised. 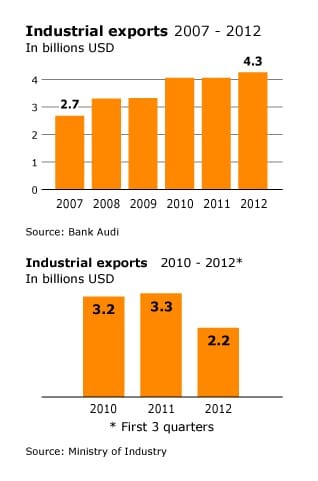 Bank Audi reports that exports increased by 5.1 percent while imports increased by 5.6 percent in 2012. 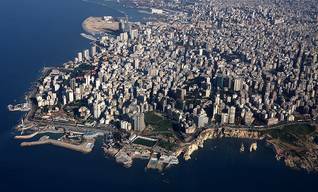 Lebanon’s banking sector has proven resilient, with 8 percent growth in 2012 and total assets reaching USD 151.9 billion. Banks continued to attract substantial financial inflows from abroad. The arrival of tens of thousands of Syrian refugees has stimulated basic consumption, as well as real estate rentals (by those who can afford it). But overall, the net outcome for the Lebanese economy was negative, according to a report by the Lebanese Bank Audi. Lebanon is suffering from great pressures as a result for its hosting of 1.5 million Syrian refugees; whereas the World Bank estimates that 200 thousand Lebanese became under poverty line due to the Syrian crisis, to be added to the previous ones which their number reaches million people. The gross domestic product (GDP) in 2015 had reached 47.09 billion US dollars, in comparison with 45.73 and 44.35 billion dollars in the years 2014 and 2013. According to the International Monetary Fund the GDP per capita in 2015 had reached 11157 US dollars. It is predicted that the Lebanese economy will grow in 2017 by a rate of 2%, in comparison with 1% in the years 2015 and 2016. For the first time in two years, Lebanon will witness inflation by a rate of 2%, comparison with -0.7% and -3.7% in the years 2016 and 2015 respectively. The World bank predicts that the Lebanese economy will witnesses a slight economic revival due to the increase of the strength of the real estate sector, and increasing the number of tourists. Despite that the challenges and risks which the Lebanese economy is facing are big, among which is the possibility to be exposed for more deceleration in cumulative net assets in foreign currency in the face of the two continuous and big deficits in the general budget and current account. Lebanon occupies the 101st rank on the Global Competitiveness Report for the period stretching between 2016-2017. Historically, there has been a disparity between the accessibility of Lebanon’s – mainly urbanized – coastal regions and its mountains, which are only partly accessible. Paradoxically, the lower mountains are the least accessible, as they are extremely steep, whereas the higher mountains are the location of winter and/or summer holiday resorts. Until 1975, Lebanon was a modern state with a good infrastructure – one of the best in the region. As a result, the country was extremely competitive as a (financial) services provider. However, the Civil War (1975-1990) brought this to an end. While buildings, roads, and communication centres were being destroyed in Beirut and other cities, other countries – such as the Gulf States – were developing their infrastructure. From 1990, Lebanon – and Beirut in particular – developed a feverish building activity: roads, apartment blocks, and business offices were constructed at a great pace. Unfortunately, however, these buildings come under attack every time violence resurges. 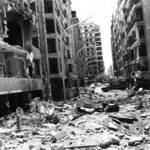 In 2006, for instance, large parts of the Beirut area were bombed by Israel during the 33-Day War. According to the Ministry of Social Affairs, quoted by the BBC, 5,000 private homes were damaged, 62 bridges, 72 overpasses, 22 fuel stations, 3 dams, 600 kilometres of roads, the lighthouse, the ports of Beirut, Tripoli, and Jounieh, Beirut International Airport, as well as Qaleiat domestic and Rayak military airports, over 150 businesses, power plants, a sewage plant, a mobile phone antenna, and Hezbollah’s al-Manar TV station. In 2008, according to what seems to be the latest update of the special website rebuildlebanon.gov.lb, 97 percent of the infrastructure had been repaired, at a total cost of USD 345.4 million. On the international Logistics Performance Index (LPI), measuring infrastructures, border procedures, services – but also factors such as bureaucracy and corruption, 96 out of 155 in 2012 (with infrastructure ranking 102), down from 33 in 2010 (infrastructure ranking 41). While Lebanon was one of the improvers in the upper middle income group in 2010, it has lost this position as of 2012. (See also Connecting to Compete. Trade Logistics in the Global Economy, World Bank, 2012). Both water and electricity could be abundant, as a result of the many mountain rivers and sources. Yet, lack of power capacity of the main energy supplier Electricité du Liban (EdL) has led to daily power cuts all over the country on a permanent basis. Power cuts ranging from 3 to 23 hours a day affect homes and businesses. A supply of less than 1,500 mW does not cover the demand of more than 2,400 mW, according to Middle East Economic Survey (MEES). As a consequence, both households and businesses rely heavily on private generators. Electricity from the public network is permanently available in only 14.3 percent of residences, 73.7 percent have to cope with daily power cuts. Subsidies to EdL, which is a public enterprise, cost the government USD 1 to 1.5 billion a year, widening the fiscal deficit. The energy sector is one the fields in which consecutive Lebanese governments have failed to implement reforms, prolonging the critical energy crisis (see MEES). As a World Bank report, Lebanon Social Impact Analysis (2009) notes: ‘One of the most striking aspects in the electricity sector is the heavy dependence on the informal, private generation sector, which nonetheless operates outside any state supervision or guiding framework. Bearing in mind the potential drawbacks of introducing regulation, the fact that such a large and monopolistic energy sector player operates in the grey economy requires attention.’ The report also states: ‘Both the electricity and water sectors suffer from inadequate supply.’ During the winter, water is permanently available in 45.5 percent of homes, a percentage that drops to 21.2 during the summer. In a bid to resolve the power crisis (at least on a short term), the Lebanese government in July 2012 signed a three-year agreement with a Turkish firm to lease two electricity-generating barges with a combined capacity of 270 mW. In February 2013, the government signed an agreement with the Kuwait Fund for Arab Economic Development for a USD 85 million to be used for upgrading the two power plants at Zouq, north of Beirut and Jiyyeh, south of the capital. According to Minister of Energy and Water Jibran Basil, Lebanon has stopped importing 200-300 mW of power from Syria and Egypt due to the political crises there (see MEES). Despite the limitations due to the erratic electricity supply, Internet has developed rapidly and the telephone network even more so. According to Internet World Stats, Lebanon had 2,152,950 Internet users and an Internet penetration of 52 percent in June 2012, compared to 600,000 users or 13.3 percent in 2005. Yet, despite growth, Lebanon has one of the slowest Internet connections in the world, slower than most Arab countries. It ranked 153rd out of 184 countries on Net Index (2013). The International Telecommunication Union (ITU) estimates that in 2011 there were around 3,350,000 mobile phone subscriptions in Lebanon, or 79 subscriptions per 100 inhabitants. In 2005, there were only 25 subscriptions per 100 inhabitants. Lebanon belongs to the upper-middle income economies. It ranked 115th on the World Bank Business Index in 2012, down from 108 in 2010. This index ranks the regulatory environment and its effectiveness in establishing and running local businesses. In this respect, Lebanon is lagging behind compared to several other MENA countries (Middle East and North Africa), certainly compared to the Gulf States. Lebanon ranks particularly low when it comes to dealing with construction permits, resolving insolvency, enforcing contracts and setting up businesses. Lebanon’s performance in the World Bank Logistics Performance Index (LPI) has declined in recent years. In 2012, Lebanon ranked 96th out of 155, down from 33rd in 2010. Lebanon is essentially an import-dependent economy. The EU is Lebanon’s main trading partner, and accounts for 37 percent of its imports. Lebanon exports some manufactured and agricultural products, but its main asset is its service sector (banking, in particular). However, the competition in the region has become fierce. 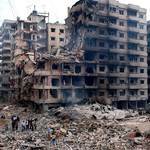 Moreover, Lebanon took heavy blows, first during the Civil War – which, after it ended in 1990, was followed by a large-scale reconstruction effort – and afterwards as a result of the Israeli bombings in 2006, when a large number of businesses, houses, and infrastructure were destroyed, and 30,000 people lost their jobs as a consequence. The reconstruction was financed mainly by decreasing tax and by short-term foreign investments. By 2012, the fiscal deficit had reached approximately 16 percent of GDP – a ratio that is not sustainable – and Gross Public Debt stood at approximately 135 percent of GDP in 2012, according to the World Bank. Between 2008 and 2010, Lebanon did notably better than the other non-oil exporting countries in the region, with an annual GDP growth of 7 percent in 2010. 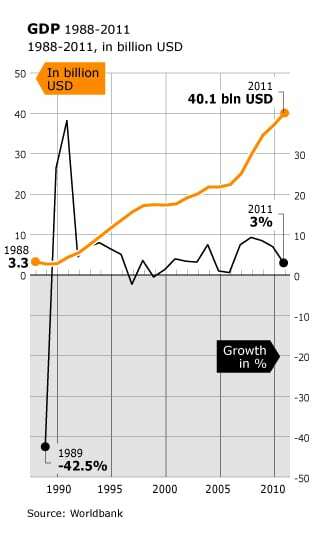 However, growth decreased to an estimated 2 percent in 2012. The International Monetary Fund put projected growth in 2013 at 2.5 percent. Main negative point remains the current account balance: -16.2 percent of the GDP in 2012. The projected percentage in 2013 is only slightly less: -15.6. The main problems mentioned in surveys among private entrepreneurs are corruption, cost of finance, tax rates, electricity and the legal system. In the survey From Privilege to Competition (MENA Development Report, World Bank, November 2009), two out of three interviewees complained that the regulations are interpreted inconsistently and unpredictably (survey held in 2006). In July 2007, the World Bank redefined its assistance strategy, referring to a reform programme presented in January 2007 by the Lebanese government, Recovery, Reconstruction, and Reform. This programme focuses on 1) fiscal adjustment to reverse Lebanon’s unfavourable debt dynamics and reduce the debt-to-GDP ratio through rationalization of expenditures, improved efficiency and enhancement of revenues; 2) growth-enhancing structural reforms to strengthen the business environment; and 3) social sector reform to strengthen social safety nets to reduce poverty and vulnerability and increase efficiency and effectiveness of social spending including in health and education. Industry is not Lebanon’s main sector, far from it. Industry accounted for 20 percent of GDP in 2011. According to a 2010 report of the Ministry of Industry (covering data from 2007), Lebanon has 4,033 establishments with five workers or more, half of which are small enterprises. Half of industrial establishments were located in Mount Lebanon, followed by Bekaa (18.4 percent) and North Lebanon (12.8 percent). The Ministry describes the sector as ‘not very diversified’. Interestingly, the report excludes establishments in tobacco, power and water and construction. According to a more recent report by Bank Audi (Fourth Quarter 2012), industrial activity in 2012 was boosted by an increased demand from Syria, while activity in Lebanon itself was constrained, affected by the deteriorated political situation and security threats. Industrial exports increased by 4.8 percent in 2012 (USD 4.3 billion in 2012 compared to USD 4.1 billion in 2011). However, the latest available industrial exports figures of the Ministry of Industry (Arabic only) show a different trend. In the first nine months of 2012, exports reached USD 2.2 billion, a decline of 11 percent compared to the same period in 2011. In 2011, industrial exports totalled USD 3.3 billion, up from USD 3.2 billion in 2010. Main export products in 2012 were machinery and mechanical appliances (USD 364.4 million, 16.6 per cent), followed by precious stones (351.6, 16 per cent), base metals (USD 326.1 million, 14,8 percent), prepared foodstuffs (USD 288.3 million, 13.9 percent), chemical products (USD 255.9 million, 11.6 percent). Main export partners were Syria, Saudi Arabia, UAE, Iraq, Turkey, Jordan, Italy and South Korea. The building sector got a boost after the Civil War ended in 1990. It also attracted – partly because of monetary measures – the bulk (70 percent) of foreign investors, in majority Lebanese expatriates, and investors in the Gulf States. 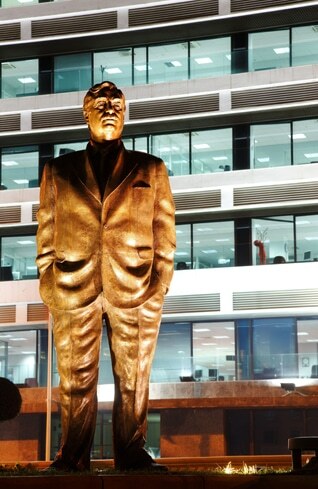 After the murder of former Prime Minister Rafic Hariri in 2005, however, construction stagnated, as did agriculture and industry. Not only was Rafic Hariri an important motor behind the construction sector, his murder also meant more political uncertainty. Ironically, the Israeli bombings of the country in 2006, however much they meant a setback for the economy as a whole, gave a new impulse to the construction sector and attracted international assistance. According to government information, almost the whole infrastructure has now been repaired, at a total cost of USD 345.4 million. The sector also benefited from tourist-related projects, including the construction of hotels, private holiday homes and luxury resorts. However, in recent years the construction sector’s performance has been declining. The number of property sales transactions, one of the indicators of the sector’s performance, declined by 10.1 percent in 2012. While the value of property sales increased, it stayed below the 2010 level. The value of transactions increased in regions characterized by lower prices, i.e. Nabatieh, Bekaa and the South, while in the more affluent regions of Beirut, Metn, Baabda and Kesserwan the value stagnated or dropped. The number of construction permits (in square metres) issued by the Lebanese Order of Engineers and Architects (Arabic only) dropped 11 percent in 2012 (12,367,081 square metres) compared to 13,884,012 in 2011. The regions of Beirut (-18 percent), Mount Lebanon and Nabatieh (both -13 percent) were particularly affected. Only Bekaa (+5 percent) saw an increase in construction permits. 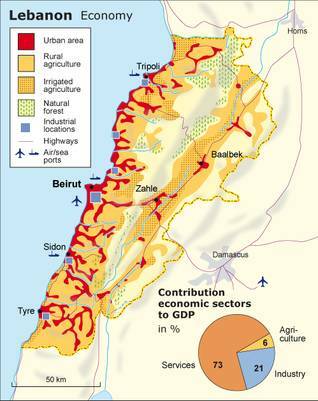 Lebanon’s agricultural production is estimated at 2.7 million tons with a total value of USD 1.2 billion. According to the latest statistics of the Food and Agriculture Organisation of the United Nations (FAO), total production of the top 25 commodities amounted to 2.37 million tons in 2011, worth USD 990 million. That is a slight decrease compared to production in 2009, which amounted to 2.38 million tons, worth USD 999 million. Agriculture is mainly concentrated in the Beqaa Valley (40 percent), North (25 percent), South (20 percent) and Mount Lebanon (15 percent) regions, and is essentially made up of vegetables (47 percent), fruits (35 percent), cereals (15 percent), and olive trees. Fruit production mainly consists of citrus fruits (oranges, lemons, mandarins, and grapefruits), followed by grapes, apples, and bananas. Vegetable production mainly concerns potatoes, followed by tomatoes and cucumbers. The main cereals produced are forage crops, wheat, and barley. The main animal products are red meat, poultry meat, fish, milk, and dairy products, eggs, and honey. Since the Lebanese agricultural production does not cover the needs of the local market, Lebanon relies mainly on imports, which consequently generates a substantial deficit in the agricultural trade balance (81 percent). The main imported agricultural products include bovine animals, tobacco products, cheese and milk, wheat, maize, and rice. With regards to exports, the main agricultural products are tobacco products, preserved fruits and vegetables, sugar confectionary, fresh fruits and vegetables, and wine. In the first half of 2011, imports had widened the agricultural trade deficit to USD 850 million, according to a review of the sector by The Business Year. Imports of agricultural commodities declined due to weaker local demand (-0.2 percent) in 2012. In recent years, a higher demand from Gulf Cooperation Council (GCC) countries and war-torn Syria led to an increase in Lebanese agricultural exports. Exports amounted to USD 222 million in 2012, a 10.4 percent increase compared to exports in 2011. Exports to the GCC amounted to 38 percent of total agricultural exports, while Syria received around 20 percent of Lebanon’s agricultural exports. The service sector as a whole accounts for 83 percent of exports. Service exports have grown at an exceptional annual rate of 42 percent in Lebanon. Trade is by far the most important sector of the country, accounting for a third of the GDP, more than a quarter of the workforce and more than half of all the companies. Trade is located in and around the main cities, firstly Beirut. In the 1990s, international highways that link Lebanon to Syria have witnessed the emergence of various shopping malls and trade centres, initially catering mainly for Syrians whose own country was at that time less open to imported consumption goods. This has changed, however, as a consequence both of a deterioration in Lebanon’s relation with Syria and as a result of economic changes in Syria. In the past years Lebanon has seen the arrival of French or British department stores and grocery chains. In recent years, the trade and service sector has been affected by the Arab Spring and the local political situation. These developments have curtailed consumption and investment spending. Yet trade in Lebanon’s main ports increased in 2012, partly as a result of the diversion of trade activity from Syrian routes. According to the latest statistics of Beirut Port, the port handled 2,125 ships in 2012, compared to 2,285 ships in 2010. In the first quarter of 2013, 522 ships passed the port, a slight increase compared to the same period in 2012. The volume in trade (TEU, Twenty feet Equivalent Unit) increased from 599,433 in 2010 to 634,969 in 2012. Activity within Beirut’s Rafic Hariri International Airport was boosted by the arrivals of Lebanese expatriates and Syrian refugees. It recorded a 5.7 percent increase in the number of passengers in 2012 (5,913,305 compared to 5,596,274 in 2011, see Bank Audi report). Banking Sector Penetration is much higher in Lebanon than in other MENA countries, or emerging countries for that matter (eighteen branches for 100,000 people, compared to less than fourteen in Bahrain and ten – the emerging countries average – or less in all other MENA countries). The total number of banks is 62. Banks in MENA countries face only limited competition, except in Lebanon, which has by far the highest percentage of foreign-owned banks. The banks in Lebanon fared extremely well during the past twenty years, due to the rebuilding programmes after the Civil War (and later the 2006 war with Israel). These programmes were mainly financed by large loans against extremely high interest rates. Financial indicators point to on-going strength in the banking sector. Commercial bank deposits are growing at more than 20 percent year-on-year and deposit dollarization has dropped, assisted by steady confidence and attractive domestic interest rates. In part thanks to prudent banking sector supervision, banks have virtually remained unaffected by the global financial crisis and have remained profitable and well-capitalized. Despite stagnating foreign direct investment, strong non-resident deposit flows should allow the Central Bank (Banque du Liban) to continue accumulating international reserves at a comfortable pace, even in the absence of government market financing from abroad. Despite the economic and political effects of the war in Syria, Lebanese banks have managed to maintain high deposits, which registered an 8 percent yearly increase to reach USD 125 billion at the end of December 2012. Lebanese banks’ liquidity status, which Bank Audi describes as ‘more than favourable’, allowed banks to continue extending funding to the economy at large. Lebanon boasts a variety of activities and historical or natural sites to visit – from sea resorts to six skiing resorts, from rural heritage to cycling, hiking, and trekking (see also Regional development). Lebanon enjoys a rich cultural legacy inherited from past civilizations, with five UNESCO World Heritage Sites. However, most of its internationally renowned historic sites are situated in densely populated urban areas which are typically exposed to the pressures of modern development and post-Civil War reconstruction. The development pressure is compounded by the fact that local governments lack the resources and mechanisms to preserve and manage these sites. As a result, the historic and archaeological sites are suffering from physical and environmental degradation, with local municipalities and residents reaping little economic benefits that come with a thriving tourism industry. In 2009, the Lebanese Parliament ratified a USD 31.5 million World Bank loan to the Government of Lebanon to create the conditions for increased local economic development and enhanced quality of life in the historic centres of five main secondary cities, and to improve the conservation and management of Lebanon’s architectural cultural heritage. The proposed Cultural Heritage and Urban Development project (CHUD) concerns Baalbek, Byblos, Sidon, Tripoli, and Tyre, where signs of damage, decay, poverty and economic stagnation due to the Civil War are still visible. Already before the Civil War, Lebanon’s beaches and mountain resorts were very popular among travellers from abroad, mainly from other Arab countries. When the Civil War was over (1990), tourists started to return and their number rose steeply until the 2006 bombings by Israel and the political unrest at that time. Although tourism witnessed a revival after 2008, this was brought to an end due to the escalating conflict in Syria from 2011 onwards. In 2012 the Lebanese Ministry of Tourism registered 1,365,845 visitors to the country, a decrease of 37 percent compared to the top year of 2010 (2,167,989). Arab visitors (Jordanians, Kuwaitis, Iraqis, Saudis) ranked first with 458,069 or 33.5 percent (normally 40 percent of visitors). Lebanon received 444,824 visitors from Europe (32.5 percent). Visitors from the Americas ranked third with 221,174 persons (16 percent). The direct contribution of tourism to Lebanon’s GDP was USD 4 billion or 9.3 percent of GDP in 2012, according to the World Travel & Tourism Council (WTTC). Tourism generated 120,000 jobs directly in 2012; the council expects it to fall by 2.1 percent in 2013. The total (indirect) contribution of the sector to employment was 322,500 jobs in 2012. Tourism is developing in rural areas as well as in the cities (but here again, Beirut is the prime destination). It is visible in the growth of the hotel sector, which is increasing annually with 5.5 percent, and in some newly developed rural mountain areas as well as in the traditional resorts. There is an important number of foreign investments in this sector. The south of Lebanon, which used to be one of the poorest parts of the countries and suffered a lot from the clashes – and wars – between Israel and Hezbollah, has witnessed spectacular improvements in its development. This is partly due to emigration, as many expatriates from this region who did well abroad, have now built houses in the villages where they originally came from. Another reason is that Amal leader Nabih Berri, who has been Parliament’s Speaker for almost two decades, has time and time again used his influence to attract investments in his region. The Lebanese economy is mainly a services economy: services account for 75 percent of the GDP (2012) – whereas industry accounts for 20 percent and agriculture for a mere 4.5 percent – though agricultural land still accounts for 38 percent of the total land surface. Lebanon’s Gross Domestic Product (GDP) was USD 40.1 billion in 2011. Its Gross National Income (GNI) was USD 39.7 billion in the same year. The population numbering 4.2 million, 2011’s GNI per capita was USD 14,470. The GDP growth rate fell from 9 percent in 2008 to 2 percent in 2012. The trade balance shows an important deficit. Exports of goods and services constituted 23.7 percent of GDP in 2011, whereas imports of goods and services represented 50 percent of GDP. The rise in international food and petroleum prices has maintained an upward pressure on prices in Lebanon. The inflation rate (average Consumer Price Index) increased from 4.5 percent in 2010 to 6.5 percent in 2012. This is slightly higher than Jordan (4.5 percent), but lower than the average inflation in the Middle East (10.4 percent). According to the World Bank Q&A Global Financial Crisis, Lebanon felt the consequences of global financiial crisis indirectly because of its ‘strong economic linkages’ with the Gulf States through remittances, FDI and tourism. Moreover, ‘Lebanon (…) entered the crisis in weak positions in terms of fiscal and external balances.’ However,according to a September 2012 World Bank report, the large Lebanese financial sector has prospered despite the global financial turmoil. The sector has allowed the country to be relatively insulated from geopolitical developments, supported by the resilience of domestic banks and the large foreign exchange liquidity in the banking system. Rating agency Moody’s rated Lebanon’s economic strength as moderate (B1 rating). Middle East Economic Survey (MEES), citing rating agency Moody’s, reports that Lebanon’s B1 rating reflects the country’s reduced growth prospects, high government debt and persistent fiscal and current account deficits. Standard & Poor’s gave the Lebanese economy a B/B rating, in light of risks to domestic political stability and little potential for economic, fiscal and external improvements as long as the Syrian conflict continues. With its high debt and large fiscal and current account deficits, the economy remains vulnerable to shocks. In particular, the Lebanese economy is sensitive to political events, internal as well as external. The informal sector is characterized by a large number of independent or seasonal workers. In 2001, 39 percent of the workforce fell into this category, which is particularly strong in the trade, construction, and agricultural sectors. The informal economy is also more markedly present in the peripheral regions – the Beqaa Valley, the north, and Nabatieh in the south. Less women work in these regions than in Beirut, although their role in the labour market is slightly increasing, one reason being that people now marry at a later stage. Industrial firms are geographically concentrated around the main urban areas. 61 percent of the enterprises and 66 percent of the workers are concentrated in Beirut and Mount Lebanon. The establishments located in these zones constituted 74 percent of the total output and 61 percent of the investments in 1998. These numbers have remained more or less stable. There is some concentration of economic activity in and around Tripoli as well (9 percent of the population, 11 percent of the enterprises), but Beirut and its surroundings are still the centre of the economy. To spur regionally balanced growth, there are special incentives, such as subsidized prices for public industrial land in less-developed locations. 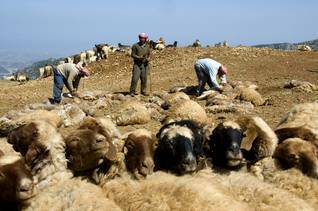 There are also some internationally subsidized agricultural projects, in particular in the Beqaa Valley.